The Country Music Association proudly reveals the initial artist lineup for this year’s CMA Fest. 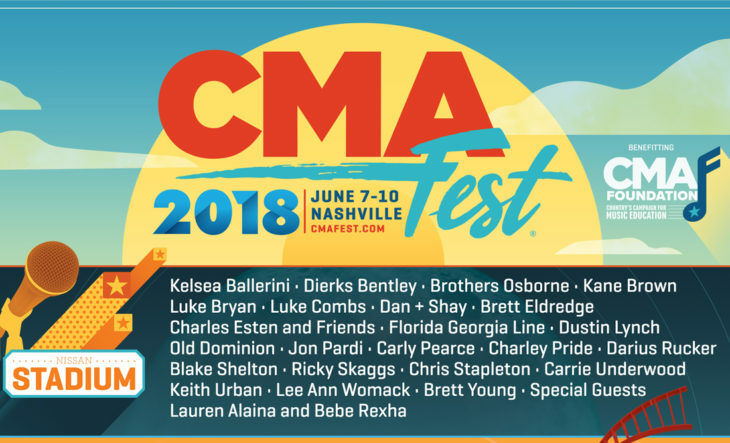 Now in its 47th year, CMA Fest boasts an exceptional bill of hundreds of artists performing on 11 stages throughout downtown Nashville Thursday through Sunday, June 7-10. 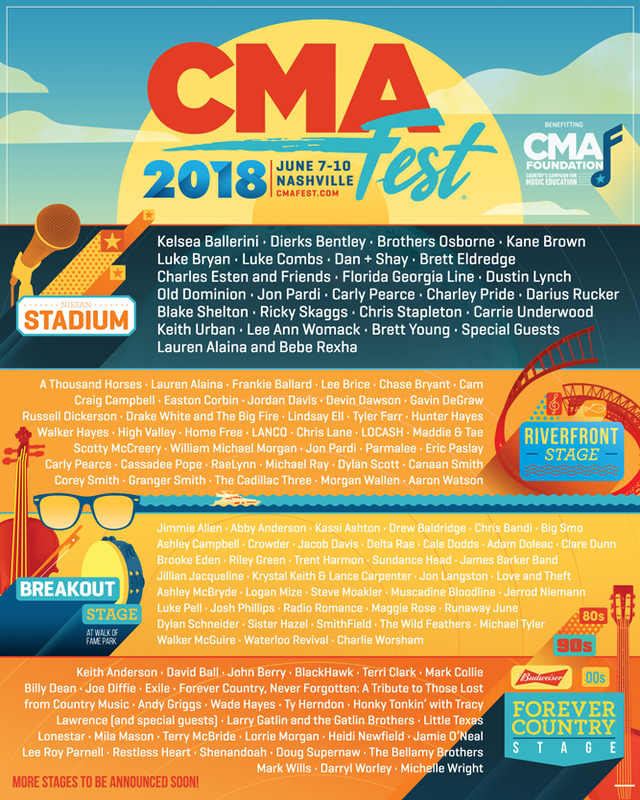 Taking the nightly NISSAN STADIUM stage this year are Country Music superstars Kelsea Ballerini, Dierks Bentley, Brothers Osborne, Kane Brown, Luke Bryan, Luke Combs, Dan + Shay, Brett Eldredge, Charles Esten and Friends, Florida Georgia Line, Dustin Lynch, Old Dominion, Jon Pardi, Carly Pearce, Charley Pride, Darius Rucker, Blake Shelton, Ricky Skaggs, Chris Stapleton, Carrie Underwood, Keith Urban, Lee Ann Womack, and Brett Young. Several acts join this year’s Nissan Stadium lineup for the first time with full sets and special performances including Brown, Combs, Dan + Shay, Old Dominion, Pardi, Pearce and Young. In addition, Lauren Alaina and Bebe Rexha will make guest appearances. Stadium gates open daily at 6:00 PM with performances starting at 8:00 PM. 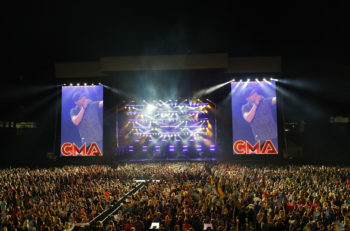 A limited number of four-day tickets for the nightly performances at Nissan Stadium are still available at CMAfest.com/tickets or through the CMA Box Office at 1-800-CMA-FEST. Returning for a second year, the BUDWEISER FOREVER COUNTRY STAGE will take place from 11:00 AM-4:45 PM daily. Featuring some of the biggest names in Country Music from recent decades, this year’s lineup includes Keith Anderson, David Ball, John Berry, BlackHawk, Terri Clark, Mark Collie, Billy Dean, Joe Diffie, Exile, “Forever Country, Never Forgotten: A Tribute to Those Lost from Country Music,” Andy Griggs, Wade Hayes, Ty Herndon, Honky Tonkin’ with Tracy Lawrence (and special guests), Larry Gatlin and the Gatlin Brothers, Little Texas, Lonestar, Mila Mason, Terry McBride, Lorrie Morgan, Heidi Newfield, Jamie O’Neal, Lee Roy Parnell, Restless Heart, Shenandoah, Doug Supernaw, The Bellamy Brothers, Mark Wills, Darryl Worley, and Michelle Wright. Additional stage lineups, Fan Fair X activities, and more will be announced in the coming weeks. Don’t miss a beat—get connected with CMA on CMAfest.com, Facebook, Twitter, Instagram, YouTube, and sign up for CMA Country Connection emails to receive the latest news as soon as it’s announced.  CMA Fest will once again be filmed for a three-hour national television special to air on the ABC Television Network. This is the 15th consecutive year the festival has been filmed for a broadcast event. 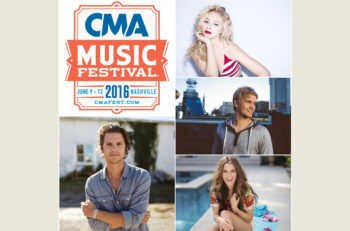 “CMA Fest” is executive produced and written by Robert Deaton and directed by Gary Halvorson.